Drop forged alloy steel blades with beveled cutting edge with fully polished, hardened and tempered finish. Includes: 1/2'', 3/4'' and 1''. Blades are carbon-steel for durability and strength with black polypropylene handle that resists deformation. Heavy-duty strike caps are crowned for centering blows and durability. Includes: 1/2", 3/4" and 1". Overall length is 7-3/4" Hardened, tempered high-chrome carbon alloy steel blade for edge retention; ergonomically designed, bi-material grip handle is shatter resistant; accessible "try me" packaging with blade guard; blade guard can be mounted to wall for home storage. Overall length - 9". 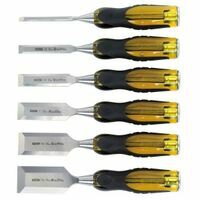 Forged steel to retain rasp and chisel sharpness, steel strike plate to protect against breakage or mushrooming. Edge teeth for removal of material in confined areas. Oversized, impact resistant co-mold handle. Hardened, tempered chrome carbon steel blade lacquered for corrosion protection. Blade has a steel striking cap for use with steel headed hammer. Blade guard can be mounted to wall for storage. Ergonomic, bi-material grip handle is break resistant. Overall length is 9". Hardened, tempered chrome carbon-steel blade for edge retention; hardened strike cap for durability; blade lacquered for corrosion protection; ergonomically designed bi-material handle for comfort and protection.